We are nominated in the World Travel Awards 2019! Ecuador's Leading Boutique Hotel! World Travel Awards was established in 1993 to acknowledge, reward and celebrate excellence across all key sectors of the travel, tourism and hospitality industries. Today, the World Travel Awards™ brand is recognized globally as the ultimate hallmark of industry excellence. World Travel Awards is celebrating its 26th anniversary in 2019. Its annual program is renowned as the most prestigious and comprehensive in the global industry. Each year World Travel Awards™ covers the globe with its Grand Tour. A series of regional gala ceremonies to recognize excellence within each continent, culminating in a Grand Final at the end of the year. 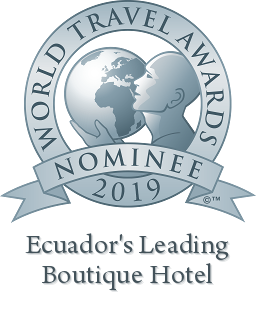 This year we are glad to announce that we have been nominated as “Ecuador’s Leading Boutique Hotel 2019”. For us, this is an enormous recognition of our hard work to always give the best possible experience to our guests. Las Terrazas de Dana Boutique Lodge is a family run business by two siblings, David and Ana, with extraordinary vision and enthusiasm. We are focused on offering the best experience to our guests and make their stay unforgettable in Mindo Cloud Forest. We are located in Mindo Cloud Forest, at the hearth of the Ecuadorean Choco Andino de Pichincha Biosphere Reserve. It is part of Mindo-Tandayapa birding circuit, Ecuador’s pioneer site in the Christmas Bird Count. In December 2018, 434 species were registered in an imaginary radius of 20 kilometers, during 24 hours, where 174 birdwatchers participated among professionals, amateurs and students; activity that strengthens the conservation and protection of the environment. In our lodge we offer many services that are common in lodges of the first category like ours, but there are two that make us stand out: the first is the extraordinary service and attention of all the staff, the second, our birdwatching tours with the most recognized guides of Ecuador, providing amateurs and professionals their most memorable experiences. 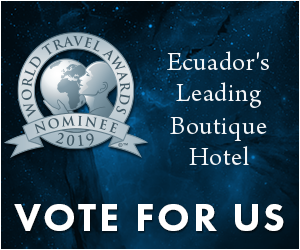 For us, this nomination represents a lot and encourages us to continue raising our standards and continue to offer unforgettable experiences and to show the wonders of Mindo Cloud Forest and Ecuador to the world.